Invaluable know-how is ensured by way of continuous advanced training and the application of state-of-the-art technologies. Our solutions for the maintenance of infrastructures are conceived to provide adaptability for the various sectors and can be implemented within a very short period of time. 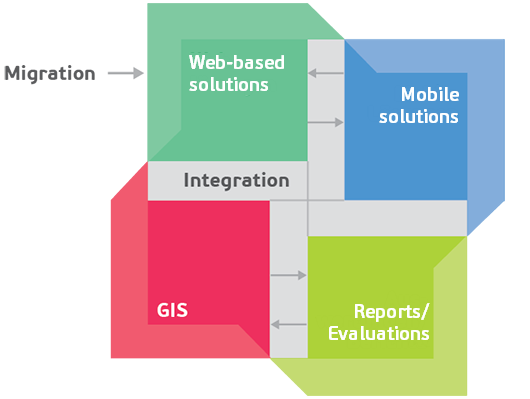 The integration of GIS, drawings, photos, documents and addresses is standard procedure. All solutions may be augmented with fully integrated modules for mobile recording of inspection (Inspecto) and the recording of observations and events (Observo). Our prime objective is to present solutions in the role of a low-cost and reliable partner. We pride ourselves in our competence, innovation, flexibility and a close working relationship with our customers.